One of the SMS use cases with the highest potential consumer usage is IVR Deflection. In this use case the brand suggests to a consumer to start a messaging conversation instead of staying on hold. If the consumer accepts, he receives a notification on a messaging channel (SMS, Facebook or in-app), where he can continue the conversation in an asynchronous interaction. In this section, we will explain the different possible solutions for achieving successful IVR deflection with messaging, and will review the required architecture. In addition, we will provide some best practices for how to implement the solution in the most efficient manner. Defining the goals for the solution. What are you target deflection volumes? Mapping the relevant skills needed for the chosen branches. Decide on the phone number(s) you would like to use in the case of SMS integration. Typical resolution flow for the most common cases. If the key issues are simple or repetitive, and can be used without asking for too many details, they can be ideal candidates for deflection. IVR deflection scenarios can be implemented in many different ways, and with different solutions such as SMS, Facebook Messenger or even Mobile App Messaging. The right solution can be chosen based on the use-case, target market and available technologies. The in-app based solution means that the consumer will be offered to continue the conversation in your mobile app. The app is the ideal channel for communication as it drives the highest engagement and allows for a more personal and dedicated experience. When the consumer accepts the deflection option he will receive a push notification. The push notification will direct him to the messaging screen within the app and he can immediately start typing with the brand. Once the consumer types his first message, a conversation will be initiated within LiveEngage and routed to the most relevant agent(s). 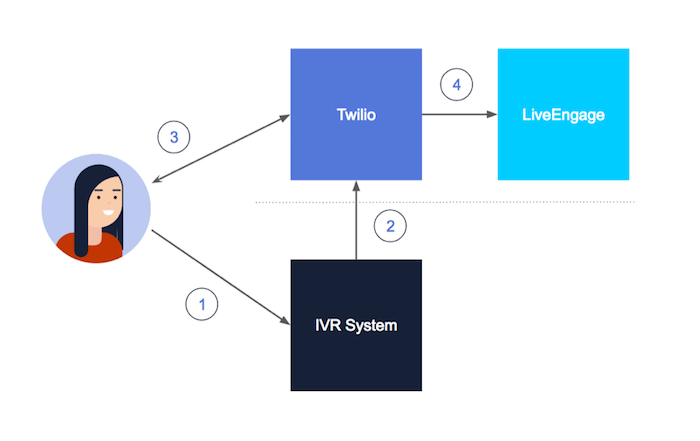 The IVR deflection implementation is comprised of several steps, both on LivePerson’s side and the brand’s. On a high-level the integration is about connecting the IVR system on the specific branches of the IVR tree. The deflection requires connectivity either to a SMS gateway (Twilio) or to your push notifications service (in-app). In order to connect the IVR system to the SMS messaging solution, you will need to first develop the IVR message that the consumer will be offered during the deflection, and second, connect the IVR to Twilio for triggering the deflection message. Facebook Messenger can be leveraged as the main channel for integration if a link to Facebook Messenger is embedded in the first SMS message. If the consumer accepts the offer, the IVR system will connect to Twilio and trigger the initial SMS message. The consumer receives the SMS message which greets him and sets the expectation (e.g. "Thank you for choosing to connect with us via SMS messaging. Please type your issue and we will be with you shortly"). The consumer types his message and a new conversation is created in LiveEngage. The best approach for implementing deflection is to do so within the brand’s app. It drives traffic to the app where additional self-service tools can be offered and, in most cases, it also leads to highest consumer engagement. Implementing the flow with Mobile App Messaging means the consumer will receive a push notification if he accepts the deflection offer in the IVR. In order to achieve this, the IVR should connect to your brand’s push notification service and trigger the push message with the relevant deflection message. This integration should be relatively straightforward and based on the technology used within the company. Since not all consumers have the app, the best practice would be to send push notifications only to active users (or consumers that have already enrolled for your mobile app, even if they are not actively using it), and use SMS and Facebook Messenger for all the others. This requires a development effort for querying a database that includes this information on the consumer’s base. In order to ensure that consumers receive a response in the same thread brands need to ensure that the initial text be sent to a full format number e.g. +1(000) 000-0000. Numbers cannot be in toll free number format, otherwise the thread will break. Consumers send millions of SMS to one another today. The B2C messaging experience is not yet fully perceived as a messaging channel, hence there’s a greater importance for setting expectations with the consumers. Setting expectations throughout the funnel is key. For example, it’s not enough to mention it in the IVR or in the first message alone. The brand should ensure that the consumers understand the SLA throughout the conversation, not only in the beginning of the conversation. An additional example is the usage of ID&V - it affects the funnel and agents should handle it carefully by explaining what it is for, its ease and its speed. The percent of repeating customers can be used as an indicating measurement for messaging containment. This metric, when monitored, can help in understanding how many consumers are actually returning to this channel instead of calling. For full containment analysis, the messaging data should be analyzed against the call data across a significant time frame (at least three months). The art of consumer expectation is a combination of System Tools and Procedures along with Agent Trainings. The journey is not just about messages but also about how Agents communicate with the consumers.